I recently had the pleasure of reviewing Freshmaker's Fruit Wet Wipes and I really love their product! You know what I like about these wipes? They have 4 very fun scents (apple, strawberry, melon and mango, and tropic). 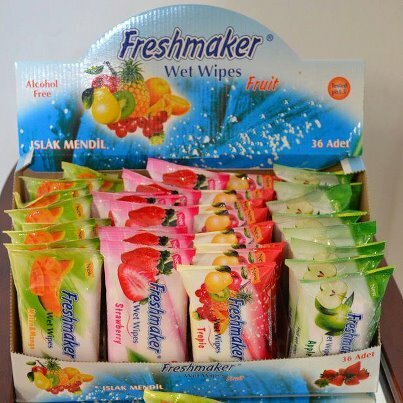 They are alcohol-free and they are free of the really harsh chemicals that most wipes contain. They come in small packages of 15 wipes - this is so nice for a mom of 3 kids like me who already has too much stuff to carry around in her purse. You can purchase these wipes on Amazon and soon they will be available in larger retail stores like Walgreens, CVS, and the Dollar Tree. Make these fun little wipes a part of your summer purse/bag/beach/outing necessities. I want to try these so bad.. I practically live at CVS an have never seen these! I recently have gotten into a natural lifestyle but am still learning so much, so it's nice to get a good recomendation like this! I am kind of germaphobe but I know it's not good to use purell too much so these would be great.